Bindi’s Wildlife Adventures are a blend of adventure, travel, and wildlife conservation. Bindi, along with her best friend Rosie, are on another adventure. This time there is a bushfire in their local national park. Rosie’s dad, Richard, is the head vet at the Australian Wildlife Hospital, so he knows well that a fire in the bush could mean hundreds of displaced and injured animals that would need to be taken care of. Bindi and Rosie offer to help with the situation. When they arrive at the hospital preparations are already being made for what the workers knew was coming. Rescue teams are dispatched to help animals who had been pulled from the fire. Bindi, Rosie, and Richard hop into a rescue vehicle and head toward the fire. Once there, they are immediately confronted with injured animals, among them an echidna and a koala; both animals have burns from the fire. Bindi immediately feels a connection with the koala and spends most of her time trying to nurse it back to health—she is trying to save not just the koala’s life, but also the joey the panda carries in her pouch. Then it happens: the wind begins to change, sending the fire directly toward Bindi’s beloved zoo. 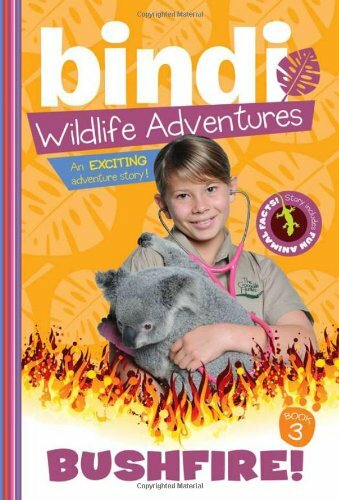 Can Bindi save the koalas and the animals of the Australian Zoo before the fire destroys everything? Bushfire! is a great addition to the Bindi Wildlife Adventures series. The plot is simple, focusing on the dangers of bushfires and how they affect not only the land but also the animals. Many animals can recover from the burns a fire can cause, but many more die from smoke inhalation and severe burns. The story is interesting and slightly suspenseful, really pulling on the heartstrings and propelling us into wanting to help animals in need. Children will enjoy this 112-page early chapter book, of which Bushfire! is the third title in the series. The story is told simply and without any fluff, getting right into the situation and the problem at hand. Readers will learn more about the echidna and koalas in the fact file section in the back of the book. Bindi stays true to her deceased father’s conservation beliefs, sharing his passion about the topic with other children. Each story in this series takes place in diverse locations involving problems that affect wildlife. A portion of the proceeds of the series goes to the Australian Zoo Conservation Projects. Readers can also become Wildlife Warriors, a group of people who love animals. Every book contains photos and more fascinating information about the animals. All children who love animals and want to make a contribution to their salvation will love the direction the series is going and will enjoy reading this book.